The crossbars shown in the pictures are not included. 7. Mount the bracket on the load bar of the roof and fix it with Small Stamping and Nylock Nuts to complete a series of installations. If you cannot assemble or find it difficult to do so. Suggest:you can find a professional to help you assemble it. It is like a DIY skill test and I hope you can finish it before you travel and have a nice day. 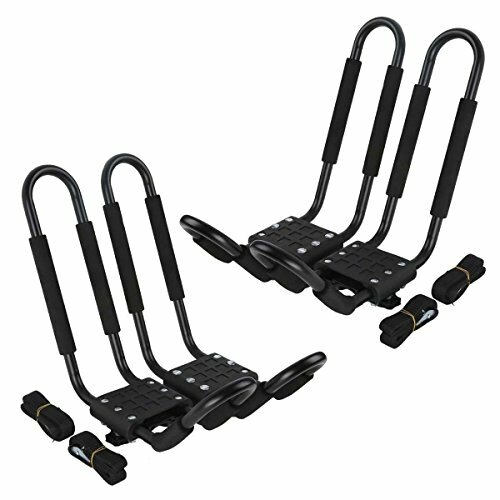 Accommodates kayaks up to 36" wide and 75lbs, Will fit most factory or aftermarket round, square, oval and flat crossbars. Optimally sized J style carrier leaves roof space. Steel design with adjustable padding for carrying strength and kayak protection. If you have any questions about this product by LEAGUE&CO, contact us by completing and submitting the form below. If you are looking for a specif part number, please include it with your message.